Since my past few reads have sent me into one book hangover after another, I decided to go on a different route for now. One of the book clubs I belong to has chosen [b:Unearthly|7488244|Unearthly (Unearthly, #1)|Cynthia Hand|http://d.gr-assets.com/books/1324782984s/7488244.jpg|9621771] as the book of the month and I thought, eh, why not? I haven't read a lot of angel-themed books but so far, only one series has impressed me ([b:Daughter of Smoke & Bone|8490112|Daughter of Smoke & Bone (Daughter of Smoke & Bone, #1)|Laini Taylor|http://d.gr-assets.com/books/1338613368s/8490112.jpg|13355552]) and the others have just been okay ([b:Hush, Hush|6339664|Hush, Hush (Hush, Hush, #1)|Becca Fitzpatrick|http://d.gr-assets.com/books/1358261334s/6339664.jpg|6525609], [b:Fallen|6487308|Fallen (Fallen, #1)|Lauren Kate|http://d.gr-assets.com/books/1358267190s/6487308.jpg|6678670]). 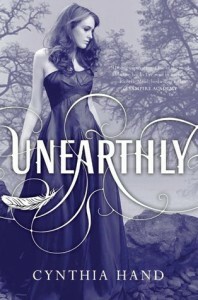 [b:Unearthly|7488244|Unearthly (Unearthly, #1)|Cynthia Hand|http://d.gr-assets.com/books/1324782984s/7488244.jpg|9621771] has an interesting plot. There is a direction to the story from the very beginning. All angel-bloods (half-bloods, quarter-bloods) receive their purpose through a vision when they reach their teenage years. This is their mission in life, to fulfil that purpose. For Clara Gardner, a Quartarius (quarter angel), her vision takes her to the middle of a forest fire, calling out to a boy whose back is facing her. She believes that her purpose is to save that boy from the fire. Upon Clara and her mom's research, they narrow down the possible places where this forest is located and concluded that it's in Jackson Hole, Wyoming. They immediately packed their bags and left California, much to Clara's younger brother Jeffrey's dismay. But a purpose is a purpose, and family must help each other fulfil theirs. As if accomplishing her mission isn't enough work for Clara, she also now struggles to fit in her new home and her new school. She finds out that the boy in her vision is Christian Prescott, a cute junior with a god-like status among the kids in school. But how can she get to know this boy when he has a girlfriend attached to his hip and is constantly surrounded by his friends? It doesn't help that Clara found herself in a non-popular group that doesn't exactly cross paths with Christian's crowd. I really liked the premise of this book, especially since it was unlike the other angel books where the main protagonist has yet to discover her true identity and that usually served as the main plot twist to those books. So this one was different. I also liked how realistic teenage problems were highlighted throughout the story. E.g. Obsessing about NOT appearing like an idiot when trying to get the attention of some boy, fitting in a new school and making new friends, feeling pushed in the middle when two of your friends don't necessarily "click" and there's jealousy that comes with it. Clara may have powers and may be good at almost anything she does but there are certain circumstances that are just beyond her control. For one, she can't do anything about the false rumors that Christian's girlfriend, Kay, are spreading about her. Second, she can't do anything about Tucker Avery constantly annoying her. Lastly, she can't do anything about her mom's opinions about what she should or should not be doing. Given the amount of things I liked about this book I still can't give it more than 3 stars. The story is good, no question about it, but there was something about the storytelling that was just off. I can't really pinpoint it to a T. There were a few, and I emphasize few, instances of eye rolls and snorts at the juvenile vibe it sometimes gave off. Then again, I can't really fault the author for that since it IS her job to make the narration truly sound like a teenager's. 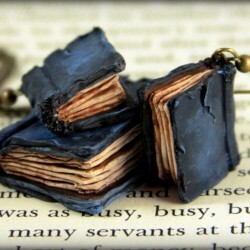 But I don't know, it just never excited me until maybe the last quarter of the book. I never felt a sense of urgency, or any strong emotions for that matter. With regards to the major reveal towards the end of the book, I kind of saw that one coming. The mystery surrounding that vision definitely makes me want to go on with this series. Plus, who can resist a good love triangle? Unlike other stories where the person the heroine ends up with is kind of clear from the beginning, this one is pretty vague. I am definitely onboard the Team Tucker wagon. I actually hated Clara for being initially mad at him for no big reason when he's been nothing but friendly towards her. I can't hate on Christian either, since he's been nice albeit a tad boring. Geez, are there no bad boys here to pick on? 1. That Tucker Avery is made into a villain, or just a jackass, in order to make us readers root for the angelic Christian. Both boys can be good and likeable. Leave it at that. 2. That there are no idiotic acts of sacrificial-I'm-doing-this-for-your-own-good kind of bravery. It's such an overplayed, self-righteous thing to do. Overall I thought this was a good pilot to a potentially great series. I am hopeful for the next two books and also eagerly anticipate a major plot twist that will make my insides turn. Gotta love YA!